This HomCom portable wheelchair ramp allows any area to become accessible for those with a physical handicap. Complete with a skid proof surface to prevent slipping this ramp is perfect for use in any weather condition. When not in use this ramp is able to fold up to save room. The guardrails on each side make it so you won't go over the edge if you aren't lined up perfectly straight. 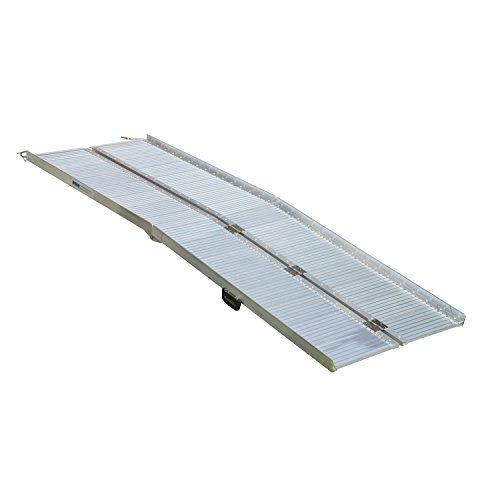 This ramp can be used with wheelchairs, lawn mowers, scooters or any other heavy item that may have trouble with stairs. The durable aluminum frame is anti-corrosive and will be a great tool for years. If you have the need for a sturdy ramp that can be folded up when not in use then look no further than HomCom.